February 21, 2006 | SMITHFIELD -- Children ages 2 to 5 can listen to stories and work on a craft project at the Smithfield Library at story time. Karen Bowling, the librarian in charge of story time, said, "Its purpose is literacy building -- bringing children to the library and showing them how fun books can be. It also gives an example to show parents what they can do with their kids." Thirteen children, nametags on lanyards around their necks, sat on colored cushions in a semi-circle on the floor while Bowling began the half-hour session with a rendition of "If you're ready and you know it clap your hands." Parents watch as Bowling reads love-themed stories such as This is How Much I Love You and That's What Friends Do. "They get to know the library better and they get introduced to books they might not have picked out," said Julie Finlinson, mother of two of the children, Katie and Cole. "Story time gives them a love for books. All of my kids have been in story time." Once the stories have been read, Bowling said she directs the children over to tables where materials have been laid out for a craft that fits the theme of the week. "This week we can be the king and queen of hearts!" Bowling said, pointing to the tables with paper crowns and hearts, stickers and markers. As Bowling began handing out lollipops, the kids began to make their crowns. "It's great. We've been doing it for a while and it keeps their attention. Story time is a good way to start to let them learn how to sit still," said Karen Gardner, mother of Janessa and Bryson. "The projects are great and my kids keep every one of them. It's also a good way to get books and do reading with the kids." "Everyone loves Karen. The kids are crazy about her," said Suzanne Johnson, mother of Blake. Bowling began the program 10 years ago when she started working at the library. "I felt like it was part of my job and something I needed to do," she said. "My very first story time I had one child and one session a week; it's just grown and grown." 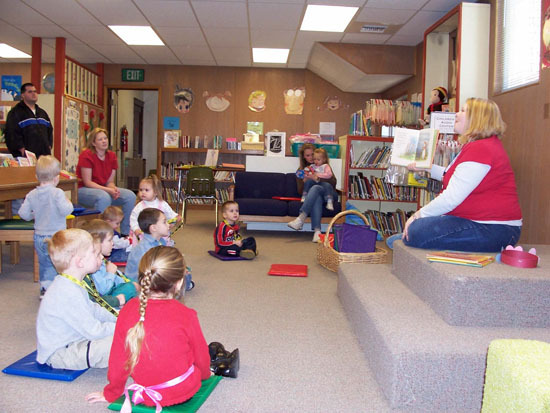 Pre-school Storytime, for ages 3 to 5, is held six times a week, while Time for Twos is held once a week. Each class is limited to 14 children during the fall, winter and spring sessions. The summer session has no limit on how many children can attend because it is held outside. Story time is free, but Bowling said registration for the last session filled up in one day and she has a waiting list. To find out more information on story time visit the Smithfield Library Web site or call 435-563-3555.